Autumn is a time when gardeners start to cut back and clear away and we should not lose the chance to recycle some of nature’s bounty. 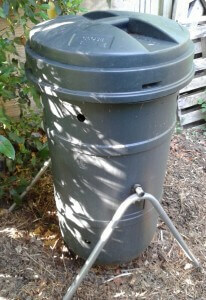 Composting often attracts a ‘muck & magic’ mystique but a few scientific facts explain & simplify the process. The value of composting your own garden waste and uncooked vegetables is in returning nutrients to the soil for next season’s plants. The huge advantage of compost over dry fertilizer is that well-rotted organic matter also improves the structure of the soil. This means that the soil is ‘open’ so air can circulate and has a good balance between drainage and water retention because organic matter acts like a sponge. On light, sandy soils compost retains water and on clay soils it promotes drainage and reduces solidifying in summer. So Well-Rotted Organic Matter, dug in or mulched on top, is the answer to many difficult soils. Organic matter, nything that once grew on a plant, is decomposed naturally by micro-organisms present in the soil using nitrogen, carbon and air. Nitrogen comes from the green leafy elements of the compost heap, carbon from woody stems and good air circulation encourages quicker rotting at a higher temperature. Always mix grass clippings with bigger material to prevent them being squashed tightly and rotting to a slimy mess. If you fill the container at one time with a mix of whole weeds, woody stems & grass clippings, then in summer you can ‘hot rot’ which takes only four months to generate usable compost. In cooler months or when you fill the box over time then you need to leave it for a year. Avoid weeds that have gone to seed and anything diseased as home composting rarely achieves a high enough temperature to kill them. So get a compost bin or two and give ‘nature’s recycling’ a helping hand. Your plants will love you!